It has big sound and enough juice to go the distance. In February 2016, a new kind of Bluetooth speaker arrived on Kickstarter and easily met its goal. It was called Soundboks, a massive portable battery-powered unit that was built to rock a party and survive the experience with its metal grille and roadie case-style edges. A few months ago, the Soundboks 2 was launched with a series of improvements, including an audio boost up to 122 dB. This speaker has a rock-solid build and owes its beefy output to two 10-inch woofers, a soft dome tweeter and three amplifiers with boost converters to help maximize sound and efficiency. This thing is a monster, but in a good way and I just had to try it out. It's definitely a powerful sound system, but it doesn't come cheap at $899. This speaker wasn't made for everyone, though. It's eminently useful for things like street side busking, flashmob parties, mobile DJing and beach bonfire bashes, while it may be overkill for listening to NPR podcasts in the kitchen. Modern-day Radio Raheems will enjoy the freshly redesigned LiFePO4 battery, which is rated for about eight hours on a charge at full volume and 40 (or more) hours if you're keeping it chill. 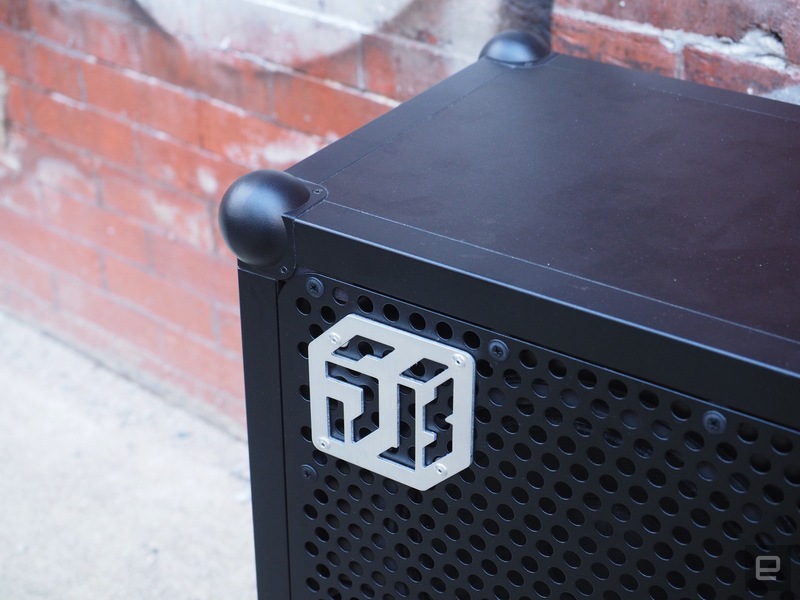 On its exterior, the Soundboks 2 is all pro. It's solid, rugged and built to haul around. There are handles on each side and metal ball corners with metal piping around all the edges. 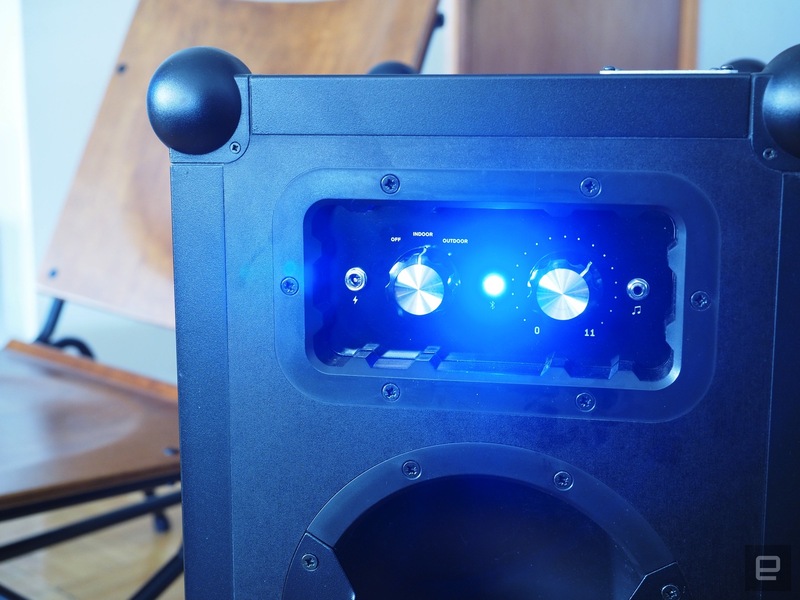 The front of the speaker is covered in a metal grille, so you won't have to worry about those cones getting accidentally damaged. I tested the model with black powder-coated aluminum, but I could see how the silver version would probably show wear and tear less after a while. Cement and other gritty surfaces can scratch through the black and leave silver scuffs. Above one handle, is the cavity where you insert the rechargeable Batteryboks. It's easy to install and remove, too, since it's just a rectangular block with a handle on it. There are grooves to guide it into place and keep it snug once inserted and a single plug to connect. There's also a button on the battery that will give you the current charge status in 20-percent segments. On the opposite side is the barebones control panel with the requisite volume knob that does indeed go up to 11. There's a second knob to control power and environment settings for indoor and outdoor zones. The former maxes out at about 100 dB and has less bass compared to the latter, which tops at 122 dB and utilizes an integrated psychoacoustic chip to enhance the bass experience. I'll just say that labels be damned; I like the outdoor setting most of the time regardless of where I'm using it. Next to the knobs, all you'll find are a mode status light and two ports. One is a DC charging input, which you can use to either charge the battery while it's installed or, if you must, you can use it to run the speaker without the battery -- but you won't get maximum volume this way. The other port is a combo AUX / 3.5mm minijack. With a hardwired input, you'll get a bit more volume and better quality audio than Bluetooth streaming. If you purchase the optional Proboks accessory, you'll be able to use multiple inputs and expand the audio to cover up to six Soundboks speakers. They even have top hat cutouts in the bottoms so you can mount them up on stands. So how does it sound? It's pretty amazing for what it is. If you're a high-resolution audio enthusiast, the Soundboks may not be the top choice, but the digital signal processing and psycho-acoustic bass tweaks make it a quality wireless speaker with beefy output. I had a few friends over the other day and we were listening to music on a JBL Link 300, which is a tabletop network speaker with decent bass, comparable to the UE Megaboom's sound. I then switched over to the Soundboks 2 and accidentally sparked a kitchen dance off that went on for over an hour. It's great to have something like this around to nudge things several notches higher than your average Bluetooth or network speaker could pull off. I just hope you're tight with the neighbors. When you compare the Soundboks 2 to powered loudspeakers such as those from brands like JBL and Mackie, it's close, but not quite the same. Those have a much higher volume threshold and rarely support a Bluetooth connection. 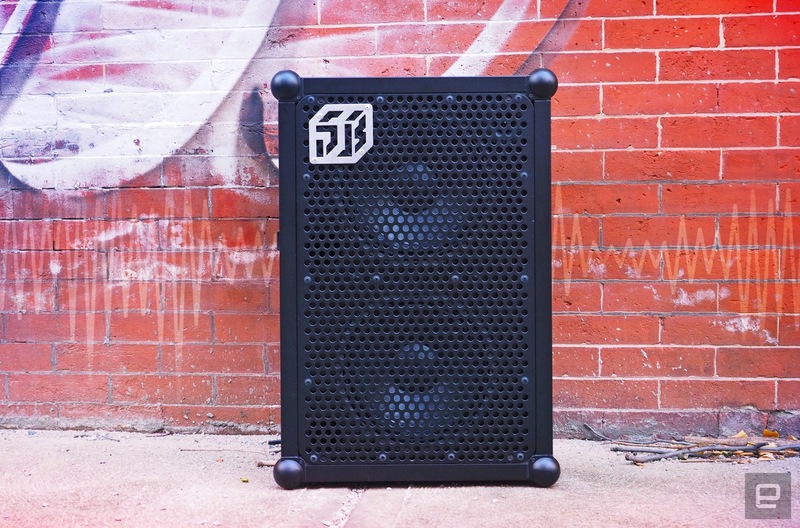 For a battery powered portable, the Soundboks is really the next best thing. Plus you get two 10-inch woofers in one box where powered models are usually a single unit. Under the hood, you get three 75-watt Merus Audio Eximo class D amps with an integrated boost converter to maximize volume and efficiency, while minimizing the drain on the battery. I didn't have a chance to play the Soundboks 2 at full volume for more than 30 minutes at a time, but did play it at medium volume in one go for over five hours and left it powered on overnight. After a week or two of sporadic use, I still have a 20 percent charge left. The claim that this speaker can run for eight hours at full volume seems like a real possibility and if you're running low volume levels, charging may be a rare bi-weekly occasion. You can also purchase an extra Batteryboks for $150 to double your air time with little effort. Connectivity-wise, I had some issues with both OnePlus 3 and OnePlus 5 smartphones. To be honest, I also had trouble connecting to a UE Megaboom speaker on those phones as well. I checked a few other devices including an iPhone 6 and Moto Z2 Force with the Soundboks, but didn't suffer the same issues. They found the device quickly in available Bluetooth devices, stayed connected without issue and had decent range, including a walk to the second floor about 50 feet away. 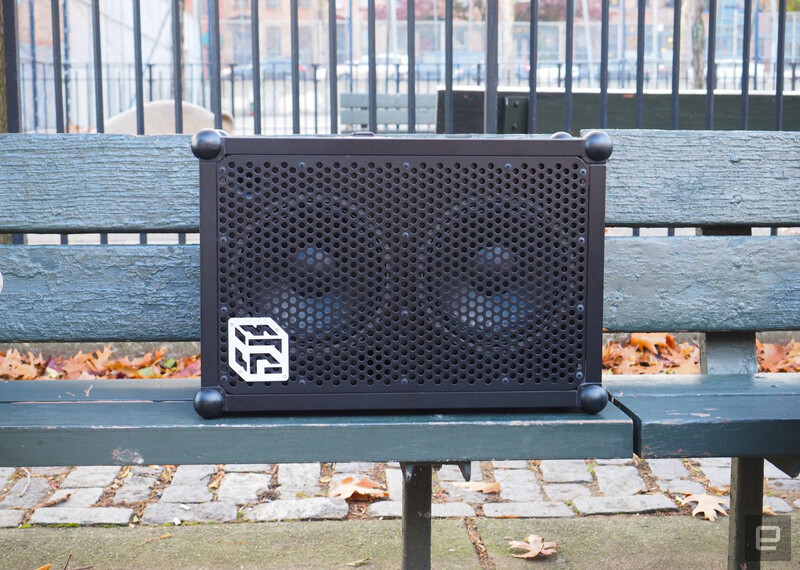 The company opted for a Bluetooth 3.0 module in the Soundboks in order to side-step any issues due to the metal grate protecting the front of the speaker, which was a must-have for durability. When I first saw the Soundboks I was extremely curious, but also skeptical about how it would work. Especially since the advertising for the product is a bit over the top. But that seems to be par for the course in a lot of similar cases. Overall, I was pleasantly surprised with how the speaker performed and it's a great example of when Kickstarter really works. I took a stroll through my neighborhood with the Soundboks 2 and this thing can turn heads from half a block away. It's a bit pricey at $899, but if you like to crank up the tunes and have cash to spend, you shouldn't be disappointed with its wireless portability and volume. Plus, it can double as a stool or end table. Am I trying to find valid excuses for spending that much money on a speaker? Yep. Also, my birthday is coming up soon. First it was skateboards, then it was DJing and collecting records. But after sorting through all the joys life had to offer (in various odd jobs) I landed at Engadget. It’s a place as weird, complicated and adventurous as one could hope. Well… it sure beats working at the mall.